This two-part tutorial is included in both An iPhone Developer’s Guide to Windows Phone 7 Programming, and Windows Phone 7 Development for Silverlight Programmers. The material is equally relevant to both and so the two series have been temporarily joined. Artwork for the game and for the tutorial was provided by Ryan Loghry. Jeff will be a guest on Yet Another Podcast where we will discuss the creation of this game and collaboration on the tutorial. The game is open source and two versions of the source code are available. Birdhunt_Blank is the code-along version that we’ll be using in this tutorial. You can also download BirdHunt, the completed version. Recall that the MainPage control is where the main game controls are located. Inside of the LayoutRoot Canvas, there is a series of empty Canvas objects that are used to hold the scoring control, ducks, background elements, and icons. These Canvases will have objects written in to them, and serve the purpose of maintaining the desired Z-ordering of the different game elements. The MainPage object also contains the startPage, which is shown in figure 1, as well as some Grid objects called readyCanvas, niceShootingCanvas, and flyAwayCanvas. These Grids contain simple rectangles with game messaging such as “Ready!” and “Nice Shooting”. Finally, there is the gameOverCanvas, which contains some simple game over messaging as well as a Play Again button. Begin coding inside the constructor by adding the _backgroundElements instance to the backgroundElements Canvas object. Follow that with the _shotCounter, _duckIcons, _scoringControl, and _levelControl objects. The Loaded event handler is raised when the Silverlight application has been loaded (surprise!). This event is here for a single purpose – performance in the WP7 emulator. While your mileage may vary, the game play runs smoother in some cases when the frame rate counter is enabled. Therefore, if you are experiencing jumpy animations and generally poor performance, try enabling the frame rate counter. If your laptop performs well, you may omit the following method. The event handler for the easy, medium and hard buttons are very similar. Each of the three methods begins by setting the _backgroundElements object to the appropriate level – recall that we have trees to obscure the view that can be enabled based on the level. The _min and _max velocity variables are used to set the minimum and maximum speeds at which the targets may be moving across the screen, and _numTargets to determine how many targets will be generated on screen when a level starts. Following that is a string to reference the level selected, and the point value we want to specify for each target that is hit. The _flapSpeed variable is a TimeSpan object that determines how fast the ducks flap their wings. The faster they move across the screen, the faster they should be flapping. The Duration property of the levelTimer determines how long the player has to shoot the targets on screen before the targets are allowed to fly away. We finish up by calling a few methods to clear and reset our game screen. The _duckIcons.initDuckIcons() and _duckIcons.resetDuckIcons() methods already exist since we already have the _duckIcons object in our project. However, the ResetScoreAndShots() and InitObjects() methods do not. The ResetScoreAndShots() method is fairly straightforward. It resets the number of shots fired, the current score being stored, and the score being displayed in the _scoringControl object. Iterate through the array of targets and assign the _flapSpeed, and use our random number generator to determine the minimum and maximum X and Y velocities for the target. Following that, randomize the start X and Y location for the object. The StartX was a random number between 0 and 800, but we want the ducks to start out off screen, so we’ll perform a quick check here – if StartX is <400, we’ll start the duck on the left side of the screen by setting its position to 0 – the width of the duck object. Otherwise, we know it starts on the right side of the screen, so we’ll flip the X scale to turn the duck around, set the duck’s position off screen to the right, and make sure the X velocity is set to a negative number to cause the duck to fly to the left. The last check performed is to see if the player has selected the hard level. If so, we initialize the hard level by playing an audio quip. This is handled this way because the audio quip should only be played once, not every time targets are released on screen when the hard level is played. The audioTimer in this case delays the gameplay for 4 seconds, which is the time necessary for the audio to play. If we’re not in hard mode, we can start the readyMessage timer that will throw us into the game loop. Inside of the previous method, we set up an event handler to determine if our target was hit. The method starts out by checking to see if the shot counter is in reloading mode. If the shotgun is reloading, a target cannot be shot. If the gun is not reloading, we’ll increment the _ducksHit variable, call out to the _scoringControl object to update our score, call out to the _duckIcons object to update our duckIcon display, and increment our _totalTargetsHit variable. Following that, we need to determine which target was hit, so we capture that using sender. If our target object is not null, we’ll call the DuckShot() method for that object, which as you recall, will send the duck into a death spiral. Close out this method by calling the CheckShotLimit() method. The CheckShotLimit() method, tracks how many shots have been fired against how many targets have been hit. 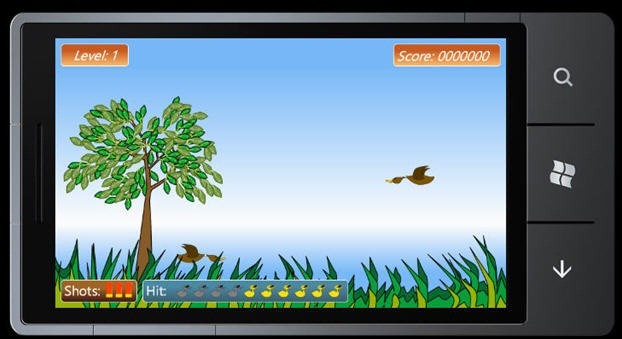 If the number of shots fired is 3, and the player has not hit all of the targets on the screen, the game stops the level timer, shows the flyAwayCanvas (“Fly Away!”), sets each duck to fly away mode, and increments the _totalTargetsMissed variable. If all of the ducks on screen have been hit, the levelTimer is stopped, and a “Nice Shooting!” message is displayed. A lot of the game logic is in place at this point, but we worked away from the remaining event handlers in the constructor, so let’s get back to those by writing up the GameLoopCompleted method. This method is called when the gameLoop timer expires. Because the gameLoop timer is an empty storyboard, it expires as soon as it is started, raising the Completed event. By restarting the timer, a running loop is created within the game. The first part of this method physically moves the ducks on screen. Remember there are two animations at work with the ducks – one to make their wings flap, then the game loop that moves them on screen. This is done by calling the MoveDuck() method for each duck. If a duck has been shot and is in its death spiral, a check is done to see if the duck has fallen off screen, and remove it if this is the case. The removal of objects is handled by the RemoveObjects() method. If no targets remain on screen, the game loop is stopped, and a call is made to the DoLevel() method (which we will also code up momentarily). Otherwise, we know our targets are still on screen and active, so we can restart the gameLoop timer. The RemoveObjects() method is called when we have a duck that needs to be removed from the game, either because it has been shot and fallen off screen, or because it was allowed to fly away. Notice that this method is passed an integer, which represents the object’s location within the _targets array. This method begins with an if statement to see if the object has been shot. If not, a call is made to the missIcon() method on the _duckIcons object. Following that, a check is made to see if the player has missed a total of 10 ducks or more. If so, the messaging timer is stopped, and a call is made to the GameOverMan() method to end the game. Otherwise, the game play can continue, but the selected target is removed from play by calling the Remove() duck method on the duck object, and the _targetsOnScreen variable is decremented. The DoLevel() method is called when the targets on screen have cleared out either from being shot, or by flying away. The first thing this method does is clear the children of the duckCanvas. Next, the levelTimer and gameLoop are stopped, and the flyAwayCanvas is hidden. The _ducksHit variable is reset, as is the _shotCounter object. The following code increases the speed of the game play a bit if the player has gone through 10 targets. The game is sped up (speeded up? spud up?) regardless of whether or not the targets were all hit. The _totalTargetsHit variable is reset for the next set of targets, and the _levelControl object is incremented. The icon counter is reset, as is the look and feel of the icons themselves. The method concludes with a little housekeeping. The _levelControl is updated to display the current level, and any potential visible messaging canvas objects are collapsed. The “Ready!” message is displayed, and the levelMessageTimer is started to prepare the player for the level. The GameOverMan() method is called when the end of the game is reached. This method clears the duckCanvas, stops messaging timers, and resets the _targetsOnScreen and _hardLevelInitialized variables. It then hides the messaging canvases before displaying the gameOverCanvas and Play Again button. OK, back to wiring up our events! Next, we have the DuckCanvasMouseLeftbuttonDown method. This method is straightforward – it checks to see if the shotgun is reloading. If not, it calls the FireShot() method of the _shotCounter objects, and then calls the CheckShotLimit() method we wrote a few moments ago. Next are the methods to handle the instructions. InstructionsShowClick is called when the Instructions link is selected on the main screen. This method makes the two controls that contain the instructions visible, and then plays the openInstructionsStoryboard. The instructionsCloseClick method plays the closeInstructionsStoryboard, and the CloseInstructionsStoryboardCompleted event that is raised when the instructions are hidden simply sets the visibility of the instructions back to Collapsed. Finally, we need event handlers for the various Completed events for the messaging in the game and the levelTimer that controls how long a player has to attempt their shots. The LevelTimerCompleted method is called when a player has run out of time to attempt their shots. This method displays the “Fly Away!” messaging, and sets the FlyAway flag for any targets to true in addition to incrementing the _totalTargetsMissed variable. The ReadyMessageCompleted method calls after the game screen has been prepped, and the player is given a head’s up that the level is about to begin (“Ready!”). This method hides the messaging and begins the timer that controls how long the player has to take their shots. It begins the background ambient sound, and starts the Quack sound effect for each target on the level. Finally, the gameLoop is started to begin the game play. This entry was posted in iPhoneToWP7, WindowsPhone and tagged i2WTutorial, WindowsPhone, wp7Tutorial. Bookmark the permalink.